Finally a ceramic vent cover that matches your porcelain tile floor perfectly. Our Flush Mounted floor vents add style to any tiling project. Each vent is made from the floor tile you've selected and designed to lay flush with your floor. Beautiful, durable and easy to install all of our Flush Mounted floor vents come complete with a sturdy steel back support and a separate diffuser (dampener) levelling plate which allows you to control the air that enters into a room. Adding porcelain or ceramic Flush Mounted vents to your new floor will give your room an elegant final touch. 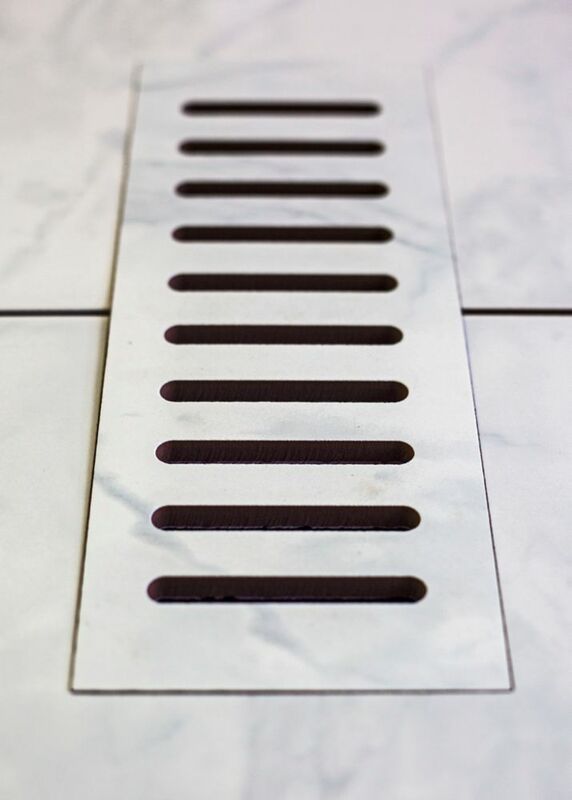 Ceramic Vents are a perfect match to your new tile floor. Durable, and safe to walk on, perfect for high traffic areas. Complete with a sturdy epoxy coated steel backer support and separate steel levelling plate. Metal back supports are bonded with state of the art epoxy to all vent covers. 1 Year Warranty. Call 1-877-636-1113 for complete warranty details, parts and installation inquiries. Speedi-Grille (Return) is a surface mount grille and is made in the USA out of a durable all steel construction with in. fan shaped louvers. It has a white paintable powder coat finish. Speedi-Grille also comes in other sizes as and styles which includes floor, ceiling/sidewall, and filter versions which are available on this website. Grille trim screws must be installed for secure installation. (Speedi-Grille can be installed in a non-Speedi-Boot installation). 4-inch x 10-inch Ceramic Vent Cover in Carrara Finally a ceramic vent cover that matches your porcelain tile floor perfectly. Our Flush Mounted floor vents add style to any tiling project. Each vent is made from the floor tile you've selected and designed to lay flush with your floor. Beautiful, durable and easy to install all of our Flush Mounted floor vents come complete with a sturdy steel back support and a separate diffuser (dampener) levelling plate which allows you to control the air that enters into a room. Adding porcelain or ceramic Flush Mounted vents to your new floor will give your room an elegant final touch.